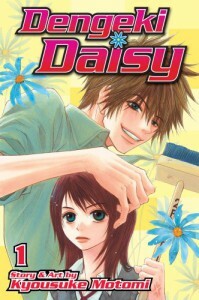 This one was a very cute manga, though Teru is a bit of an idiot at times (I mean seriously, how does she not know who Daisy is. There are hints everywhere! And isn't it a bit too convenient that he (people who read it know who the he is) is always magically there, out of of nowhere?). But I also really liked her. She was brave, she continued living and did her best everywhere. I felt sorry for her that she lost her brother, and that she is now poor and living alone. Luckily she has Daisy, a friend of her brother, with whom she is exchanging mails/messages. He always helps her out, though she never really asks for help, she just tries to make things seem totally different, much better than they really are. I am happy with that attitude. I think I would have hated it if she kept asking Daisy for favours constantly. I didn't like Kurosaki at times. He was at times just a prick and while I am sure he has good intentions (especially when we find out certain things), but I think he should have done things differently. But he is a good guy, he is there for Teru, helping her out, even giving her food (which she accepts very happily). The situations in the book are a bit over the top. Seriously? Hackers? Pervy guys? More bad guys? Several other things happening? And that all in 192 pages. Nope. I do hope the next volumes will have less of this. I want Teru to find out who Daisy is, I want Kurosaki to be honest and I want several other things. I will probably read the rest of this manga soon, since (even with the over-the-top stuff) it is a good manga with romance and comedy. Just what I need.